← Summer Week 14: Where Did Summer Go? Yesterday the broccoli crowns were just the size of a quarter. Today they are almost 3" across. They'll be perfect by next week! Last week was a glorious last gasp of summer. We needed it. The winter squashes are mostly ready to harvest now, and they were straddling the line between being not quite ready and very tasty. We need every little ounce of sunshine now to make up for missing out on the warmth we are supposed to have in May and June. The combination of soaking rain just before and after the week of 80° temperatures has made the broccoli head up and the cauliflower double in size. 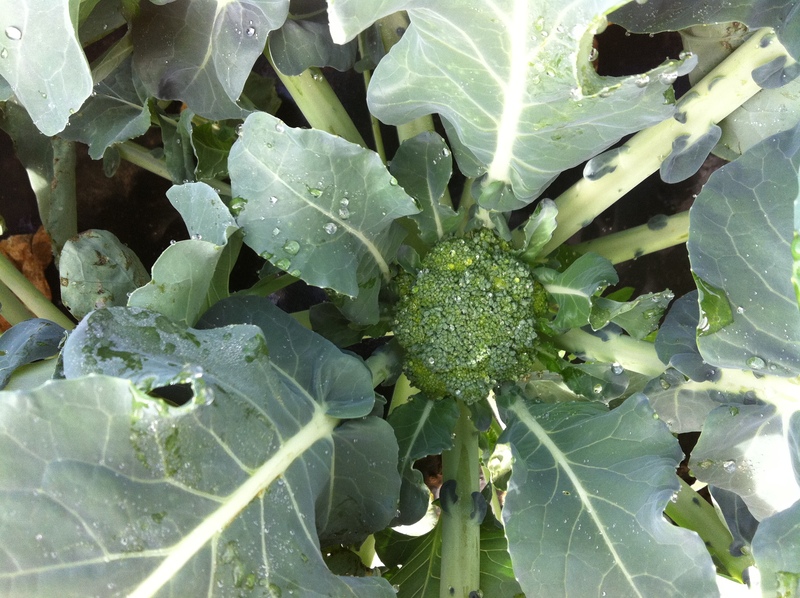 It looks like we will have beautiful broccoli next week. Victory! The basils are holding up well, and we hope you’ve enjoyed them all. If you want to make pesto for the winter, don’t hesitate. Let us know if you want extra and we’ll set you up before the dreaded first fall frost comes and blackens it all. We only have four weeks of the summer season left. Our delicious winter season starts November 2, and that’s only four more weeks. Let us know if you’re going to join us soon! And, we will be opening up the pumpkin patch to picking next week! I substituted more yogurt for the applesauce and a tablespoon of ground flax seed for the egg (alas, I forgot to ask Shelley to send me some eggs last week!). If the whole wheat pastry flour sounds daunting, try substituting part of the 1 1/2 cups with regular flour. Its a great way to transition your family to whole grain baked goods. The muffins turned out moist and delicious! Walnuts ended up in muffins for me, chocolate chips in the muffins for my sweetie. For the freezer, I made a second loaf of bread with dried cranberries and toasted hazelnuts. We had two great salads with week with the lovely lettuce in our box. The first salad was made with the speckled lettuce, parsley, purple basil, sunflower seeds (or walnuts), and some leftover shelling beans. We tossed that with a creamy garlic thyme french dressing. The second salad was made with the beautiful head lettuce (similar to butter leaf). We dressed it up with steamed beets, candied pecans, blue cheese, green onions, and thyme with a honey dijion dressing. Both were large enough for a lunch or dinner salad for two adults, especially if served with a nice roll or good bread. Another great salad today: lettuce, radicchio, parsley, basil, green onion, shredded carrot, dried cherry tomatoes, canellini beans, and sunflower seeds with French dressing. With spelt pretzels and a honey crisp apple, I was set all afternoon. The radicchio caused a fine debate at home. Was it radiccio or some kind of endive? In any event, we decided to try Mark Bittman’s “endive and warm pear salad with stilton” from Kitchen Express later this week. We have asian pears and some big boy blue that should work well. The pears and some maple syrup in the dressing should help balance the bitter raddichio while the blue cheese will add a salty note.